Professional sod installation will immediately leave you with a lush, green lawn fit for the cover of a magazine … or perfect for a family football game. Tired of the rain washing away your every attempt to plant new grass seed? Sod installation is a quick fix to this problem, and when professionally handled, it’s also a long-term solution. Sod installation may seem straightforward, but the process is much more complex than at first glance. From preparing the soil beforehand to preventing bumps and weed growth, it’s an involved process that requires the skill of an experienced team. At WKB Landscape & Maintenance, we promise a gorgeous final product, and we deliver results that exceed expectations. 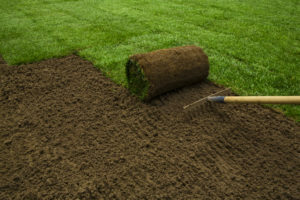 No matter the quality of the sod used, if the underlying soil isn’t prepared correctly, the sod won’t take. The area must be graded, then topsoil or lime added where necessary. When the surface is compacted and smooth, you will see the best results. Sod shouldn’t be cut until right before the installation, and it must be fully developed and ready for planting. Immature sod is less likely to put down roots, and may very well wither and die. It’s also essential to lay sod that is 100 percent weed- and insect-free. Otherwise, you risk propagating disease throughout your yard’s vegetation. WKB Landscape & Maintenance only uses the highest-quality product paired with expert sod-laying work. Every piece is laid precisely, eliminating seams and preventing weeds from sprouting in gaps. We will fully educate you on how to nourish your lawn after sod installation, explaining the watering standards required to promote successful growth. New sod needs care and attention for roots to grow deep and strong. Trust WKB Landscape & Maintenance to beautify your yard with fresh, superior sod. The best product instantly completes your landscaping, preventing soil erosion and turning heads in your neighborhood.